Finally got the chance to test out a batch of new lures from Jacks LRF today. I've wanted to try them out on the local Perch population for some time now but a frozen canal and other commitments have meant I've had to wait. Having said that, by the time I actually got to wet a line I had my game plan all mapped out. I started with the smallest of the lures - the 1.75 inch Baby Minnow - a nicely sculpted lure with a delicate little split tail. I must say, for such a value for money lure (£3 per pack of ten) I was pleasantly surprised by the quality. Even the fragile little tails were perfectly formed with no excess material to be trimmed - fished perfect straight out the pack. They feature a slightly ribbed finish which adds to the detail. Available in a range of colours, I favoured the Chartreuse Stix for the canal. 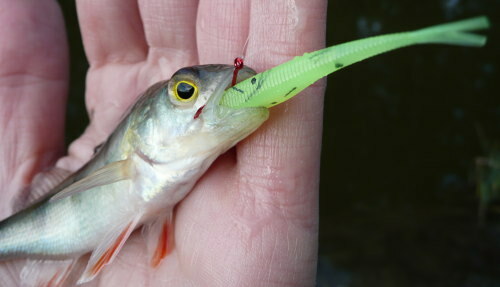 The Baby Minnow could easily be fished on a smaller hook than the size 8 Mosquito. I trimmed a little off the front of my lure to make it fill the hook gape and stand proud - not an issue with the lure at all - just me being finicky. I'm glad to say that despite my cold hands and rusty reaction times, a couple of tiny Perch obliged. There should be a photo hereabouts showing the Baby Minnow sticking out the Perch's mouth. You'll notice it's been swallowed head first. That's a hard thing to accomplish with a jighead rigged lure, so really shows a strength in the dropshot technique and also the flexibility of the lure material used - the little Perch really wanted it. 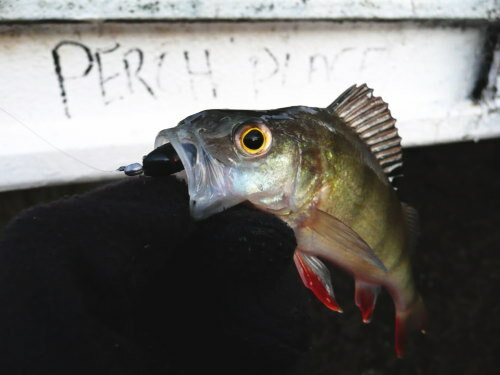 To prove this wasn't a fluke, the second tiny Perch was hooked in an identical manner. Action on the Baby Minnow is as you'd expect on a split tail, very skittish and erratic. I wasn't sure how it would perform slowed down in the cold, but it worked admirably. 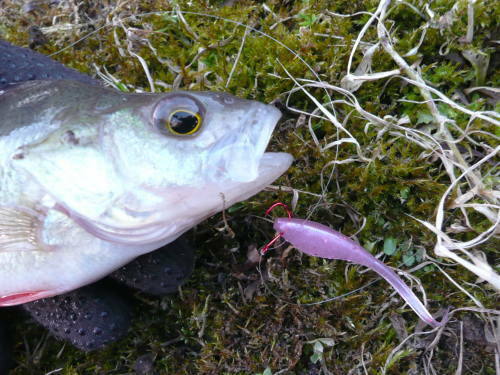 Next up was the Mega Darter, another 1.75 inch lure, most accurately described as a tadpole imitation. The only thing I'd add to that is that the tail is triangular in cross-section, with the lower side the widest. Same quality material used. No trimming required for the size 8 this time as the head of the lure is fatter. After a play below my feet, I was disappointed with the action - or lack of it. With the profile of the tail I could see that it was designed to glide and decided that it wasn't best suited to dropshot. I rigged the same lure with a tiny 0.3g Jazz Jighead and was really pleased with the result. There wasn't a great deal of water fishing the margins of the canal, but the flat underside of the lure and the ultra lightweight jighead gave me a good amount of time in the strike zone. Lots of bites and one more hooked Perch. And so I began to wonder of there were any bigger Perch around me, so I made the change back to dropshot and the last lure I was testing - the Jacks Own Sperm Tail - slightly bigger at 2.25 inch. I had a play in the extreme margins and it looked perfect for a slow presentation. I mixed it up with a different colour this time with Purple Rayne, a transparent pink colour with red flecks. It wasn't long before I located a shoal of fish and started catching bigger fish - most likely due to the bigger prey size and stunned action. It worked as perfectly as it had in my head. Really like these. Should become a regular in my lure bag this year. Just to add. As the light faded I changed lure colour over to the Black Magic. It's really nice to have an almost solid black lure in the range. This one is more like a coffee colour featuring a red and blue metallic fleck. Caught the nicest Perch of the session. In summary, really impressed by these three lures. Great quality and value on offer with a useful range of colours. 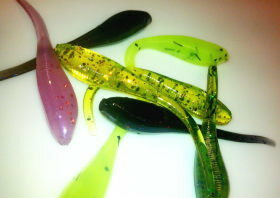 Another fine set of lures from Jacks LRF. Jacks LRF, as the name implies, was set up to offer ultralight lures to a growing following of Light Rock Fish (LRF) anglers in the UK. While pure LRF is actually a saltwater discipline, it shares a lot of techniques with modern day Perch fishing (and continental Trout spinning). What I've always found a little odd is that LRF actually seems to be better serviced with innovative tackle when compared to freshwater lure stockists - despite that being the more established discipline.